Almost every person in the world consumption of tea every day. In fact some are not sufficient if only a cup of tea consumed per day. So at least 2 cups of tea a day. The tradition of drinking tea every morning and afternoon should we preserve, or even that we pass on to our children. Because the benefits are so much to our health. Tea contains substances phenolic and non-phenolic (carbohydrates, amino acids, vitamins, flour, and calcium), as well as the accompanying tea contains catechin also useful as an antioxidant that may help protect the body from free radicals and harmful to the health of the body, there is also the type of tea , among beneficial lowering the risk of heart disease, cancer, diabetes, gum, stress, burn fat, and lose weight. Here are some of the benefits of tea and 6 types of tea most nutritious in the world's most widely consumed because so many health benefits. Increase consumption of green tea. 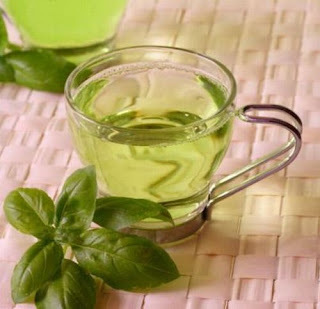 Womenfolk green tea consumption, because it can lose weight (especially belly fat). Because green tea is made from unfermented tea leaves so that it contains very high concentrations of polyphenols. Green tea is very beneficial for reducing the risk of cancer and heart disease, lower cholesterol,. Green tea is also beneficial in lowering the risk of diabetes and Alzheimer's. Black tea effectively lowers cortisol, a stress hormone. You do this by consuming black tea four times a day for 6 weeks. Black tea also can reduce the risk of cancer. White tea, white tea extract useful especially fatherly slow the growth of bacteria that cause Staphylococcus infections, Streptococcus infections, pneumonia and dental caries, and improve immune system function. No wonder if some brands of toothpaste adding white tea extract, as antiviral and antibacterial effects. Useful to help boost metabolism, burn fat, helping you lose weight and maintain healthy skin. For pregnant women would be better if you drink 2 cups of oolong tea a day can increase body metabolism. Herbal tea is beneficial in reducing stress, which is a risk factor for heart failure and premature aging, reduce stress, aid digestion, and have lots of antioxidants. We know that antioxidants are able to fight off free radicals that the body away from diseases including cancer. The benefits of green tea and honey mixture is very effective in lowering the disease-causing bacteria (pathogens) in the meat that we consume.